A suicide attack by Pakistan-based Takfiri elements on a bus carrying Iranian border guards in Iran’s Sistan and Baluchestan province has killed and wounded dozens of IRGC forces. The attack, claimed by the so-called Jaish ul-Adl terrorist group, targeted the bus carrying IRGC border guards travelling between the cities of Zahedan and Khash in south-eastern Iran. At least 27 have been killed and 13 other wounded in the blast. 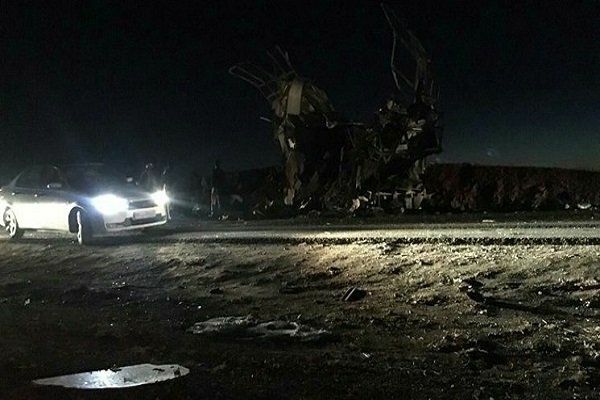 The IRGC’s Quds Headquarters said in a statement that an explosive-laden car rammed into the bus, which was taking the personnel back to their homes. Following the deadly attack, the governor-general of Sistan and Baluchestan declared three days of mourning.